Debra Bolanos is seen instructing students in the art of folkloric dance. 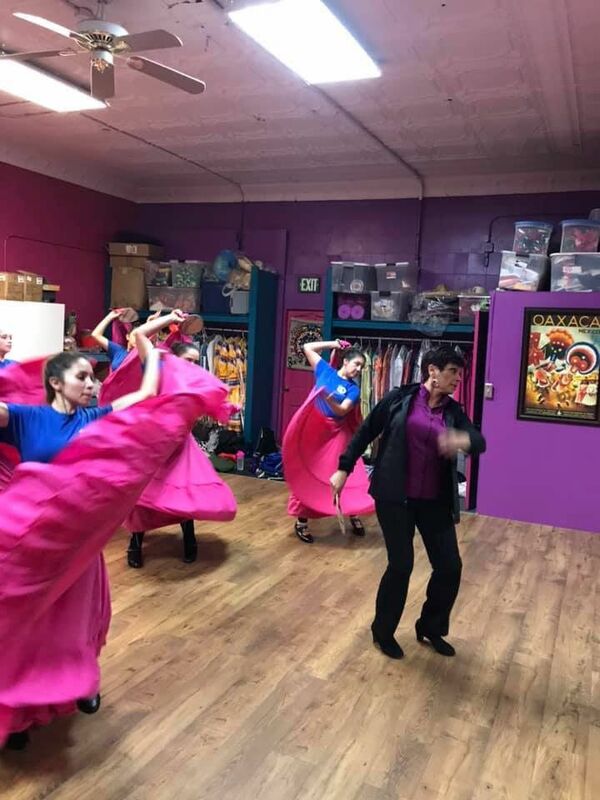 When Debra Bolanos, 60, of East Chicago, learned she was one of two Hoosiers selected to receive the inaugural Indiana Heritage Fellowship Award, it was an unexpected honor for the ballet folklorico dancer and instructor. "I was very surprised," Bolanos said. "Finally, I feel like people have recognized the work I've done. It's very humbling." The award will be presented in ceremonies to be held April 27 at Mathers Museum of World Culture on the campus of Indiana University in Bloomington. Jon Kay is director of Traditional Arts Indiana, which created the awards as an extension of its mission to recognize and preserve folk arts in the state. Harold Klosterkemper, 95, a fiddle player from Decatur County who has shared his art with children and others for decades, is the other honoree. "They represent two different geographic areas of the state, two different generations and two different genders. ... Their work is rooted in community life and both use their art to make their communities better," Kay said. Patterned after the heritage fellowships annually bestowed by the National Endowment for the Arts, Kay said the aim was to put the state's rich culture of folk art at center stage. Throughout her life, Bolanos has felt a responsibility to her community, particularly the youth, to share her art and Mexican culture. Bolanos is director at Ballet Folklorico Las Villistas, which is home to Xel-Ha Escuela de Danza of which she is founder and director. She is president of Societad Cultural y Civica la Reforma, as well as on the board of directors for Northwest Indiana Hispanic Chamber of Commerce and a member of Hispanic Women's Forum of Northwest Indiana. She is owner and manager of Galaxy Travel Inc. in East Chicago. When Bolanos travels to Bloomington to receive her award, she will be accompanied by her three children — Mariela, Salvador and Alejandra Bolanos. Alejandra Bolanos will be one of the ballet folklorico dancers during the April 27 program. A proud mother, she said Mariela is an executive chef, Salvador is a web marketer, and Alejandra is a psychology student at Purdue University. Widowed after 32 years of marriage, Bolanos said, "I've had a good family life." Her 91-year mother who founded ballet folklorico in East Chicago nearly 50 years ago lives with her. It was her mother who encouraged her to attend Ballet Folklorico School of Dance in Mexico City. She danced with the troupe there before returning to East Chicago. "I'm already reaching out to past members...We want a big celebration," Bolanos said. First up following the awards, however, is the annual Cinco de Mayo fundraiser, she said. When this writer suggested she must be quite organized, Bolanos laughed and said, "It's funny, yes, I'm organized, It's the only way I can do what I do." To learn more about Bolanos, visit online at debrabolanos.com. Traditional Arts Indiana was founded in 1998 by Inta Carpenter, the director of Special Projects in the Department of Folklore and Ethnomusicology at Indiana University. She wanted a program that would identify, document and present the folk and traditional art of Indiana. John Kay came on board as director in 2004, and in 2007, the General Assembly recognized TAI as the official folk and traditional arts service organization for the state. A year later, TAI became a special program within Mathers Museum of World Culture at Indiana University. Championing arts as part of everyday life, TAI created "Indiana Folk Arts: 200 years of Tradition and Innovation" in 2016 as a traveling exhibition in conjunction with the state's bicentennial. In 2017, TAI began a new apprenticeship program to fund teaching practices of traditional arts as they train the next generation. To learn more, go online to tradarts@indiana.edu. The Indiana Heritage Fellowship Awards will be presented in ceremonies at 2:30p.m. April 27 at Mathers Museum of World Culture, 416 N. Indiana,Bloomington, Indiana. The free program open to the public will begin at 1 p.m. and continue until 4:30 p.m. with folk art presentations and displays for all to enjoy. Additionally, the afternoon will include demonstrations from master artists and apprentices in the apprenticeship program. Those demonstrations will include Miami and Great Lake beadwork embroidery, hoopnet making, Zapotec weaving, blacksmithing and African drum making.